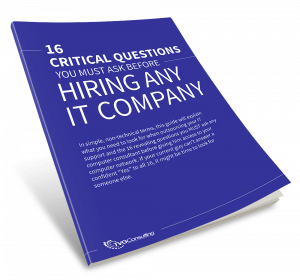 The 16 Critical IT Questions Guide is on its way! Thanks for requesting our guide to give empower you as you consider hiring an IT services company. We’re confident you’ll find the information valuable to narrowing your search. We’ve sent your copy to the email address you provided, so be sure to whitelist tvgconsulting.com so to avoid having our messages placed into junk or spam folders. Know someone else who might like this guide?